Mondays in Dresden have become well known for the weekly PEGIDA demonstrations often led by founder Lutz Bachmann. The events are normally well populated by residents of the city from all ages and all walks of life. They stand outside every Monday to protest what they see as the Islamisation of the west. This Monday also saw the premiere of a new German film called “Black Nazi” and the film’s two directors decided to make the event into a bizarre piece of performance art. 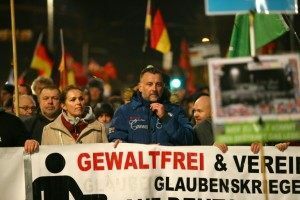 Star of the film Aloysius Itoka took to the streets outside the theatre in a rented bus where he reprised the role of his character from the film and called for the deportation of PEGIDA’s Lutz Bachmann. In the film Itoka plays a Congolese man named Sikumoya who has recently migrated to Germany. Sikumoya is in love with a young German women from Saxony, where Dresden is located. In the film they both reside in Leipzig where the African claims he has issues with native Germans staring at him all the time when he goes shopping or takes the train. After being rejected from teaching because the employment office doesn’t recognize his Congolese credentials he is chased by a stereotypical group of neo-Nazis who bash him over the head. When he awakes in the hospital has has severe amnesia. Seeing his German identity papers on the table and hearing only slogans his Nazi attackers shouted at him, he believes he must also be a Nazi. He eventually joins the films fictional Nazi party (based on the real NPD party) called the NPO. To seem more “inclusive” the NPO hired him as their “supervisor of integration.” Soon at a press conference Sikumoya claims that everything “un-German” must be destroyed. In a scathing review, film critic Frédéric Schwilden said, “the problem of “The Black Nazi” is not that it exists already; its problem is that it’s just not good. All the characters of the film, the Nazis, the girlfriend of Sikumuyo, the Saxons are so clichéd,” he wrote in Die Welt. “But the really unpleasant thing about this film is the film itself, it is moral blackmail. Of course you have to make fun of Nazis, that is important. But the jokes just have to be good,” he said.